Staying in this evening? Settle in with a glass of wine and this extended excerpt from These Things Really Do Happen to Me, the new book by Khaya Dlanga. In These Things Really Do Happen To Me, Khaya Dlanga shares some of the most embarrassing, joyful and hilarious events of his life, from his childhood until today. Sometimes real life is stranger than fiction. That certainly is the case when considering the things that happen to Khaya Dlanga in the course of his everyday life. Khaya Dlanga will launch his new book, These Things Really Do Happen to Me, in Port Elizabeth, as part of the city’s fourth annual Fruits of Democracy awards. 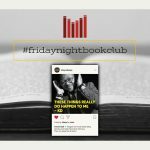 Join Pan Macmillan and Exclusive Books to celebrate the launch of Khaya Dlanga’s latest book, These Things Really Do Happen to Me. 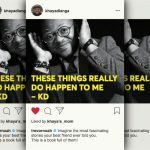 The cover has been revealed for Khaya Dlanga’s new book, These Things Really Do Happen to Me.